Vascular disease directly or indirectly accounts for approximately 70% of human deaths and is intimately linked with a number of conditions such as stroke, myocardial infarction, peripheral artery disease, hypertension, rheumathoid arthritis, and cancer as well as the new epidemics of diabetes and obesity. Despite the high social and economical impact of vascular disease, surprisingly little is known about the molecular and cellular mechanisms that affect the cells of the vessel wall during disease development. Moreover, the functional analysis of the molecular mechanisms that regulate blood vessel formation has in the past concentrated on the characterization of pro- and anti-angiogenic molecules that directly act on endothelial cells. This preoccupation with the function of isolated endothelial cells implies that interactions between endothelial cells and other vascular cells, such as pericytes and smooth muscle cells as well as the role of vascular progenitor cells, are not well understood. 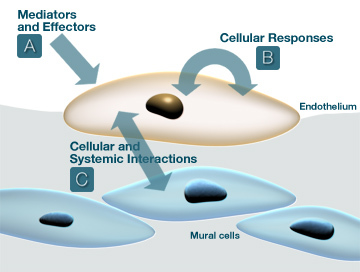 The functional and phenotypic regulation of the cells of the vessel wall is studied in various project groups with a different focus on cellular mediators and effectors (A), cellular responses (B) and cellular and systemic interactions (C).